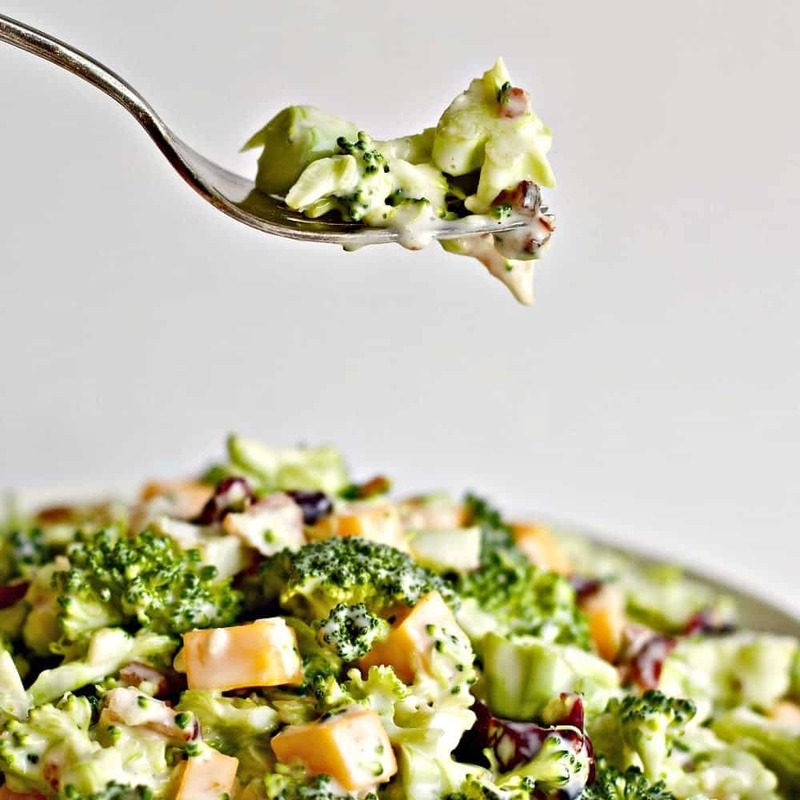 Broccoli Salad with bacon and cheddar cheese is wonderfully good. This luscious, perky gluten free side dish is full of nutritious crunchiness with a sweet-tangy dressing. This healthy salad recipe is devoured every time I make it. The Dried cranberries really spark it up! 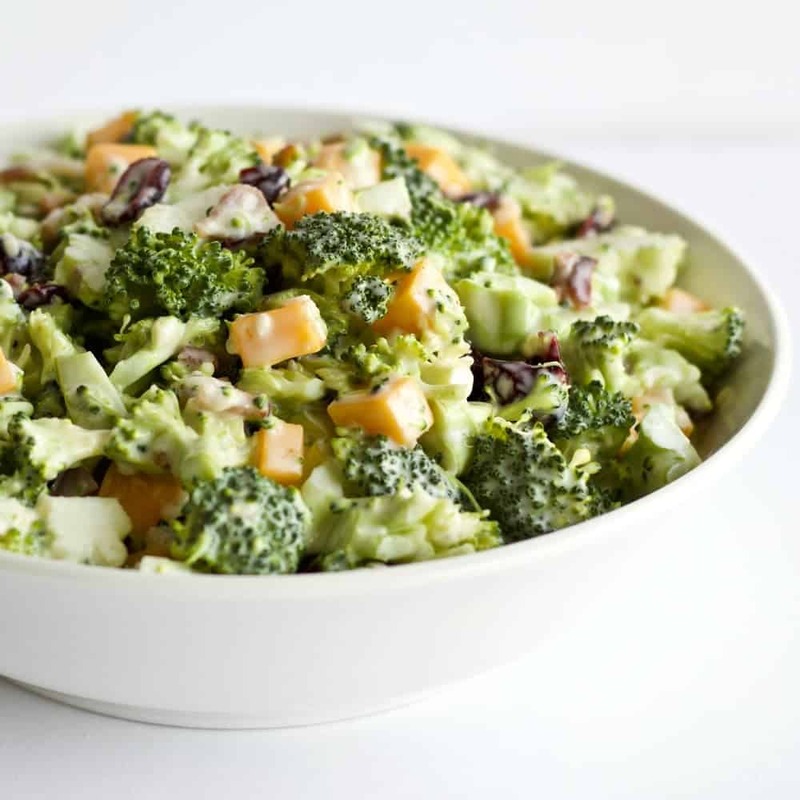 Broccoli salad recipe a beautiful healthy potluck recipe or side dish. Everyone love this salad! It’s also a good potluck recipe. Broccoli Bacon salad with cheddar is my standby salad for Holiday parties, reunions and other special events. It goes fast! Bacon and cheddar cheese add protein and wonderful flavor compliments to this popular side dish. The fresh broccoli is so crunchy, filling, and flavorful in this salad! Perfect for a grill night side, filling lunch or any ole time dinner mate. We love it! This salad is fabulous with Easy Baked Salmon with a Brown Sugar Marinade , Grilled Salmon Kabobs or Bacon Wrapped Brats. In our family this recipe is legend. It’s one of those ‘Who’s bringing it dishes’ for all of our family events. Right along with Grandma Cash’s Hamburger bean casserole and her Hash Brown Casserole. I don’t remember who brought this broccoli cranberry salad into our family circle first. But once it got in the door we were hooked. This Broccoli bacon salad uses up a load of fresh broccoli and lends itself well to various additions. Salad in our house is made with what’s in the kitchen usually. Organic dried cranberries, sunflower seeds, nuts, and pumpkin seeds are really perfect in it. But I have used sesame seeds. I have replaced the cranberries with dried cherries too. What are you putting in this salad? Let us know in the comment section how you make it. We love new ideas! Tips to protect the character of this delightful crowd pleasing Broccoli Salad. 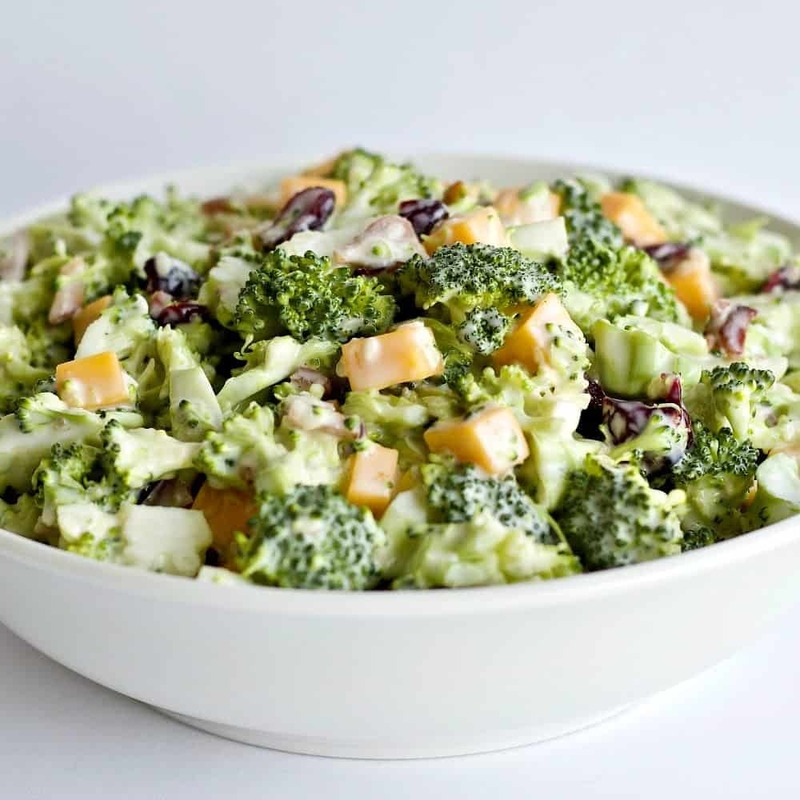 The flavors and Textures of this broccoli salad recipe are well combined to make a VERY pleasing combination. Square cheese cubes work better in this salad. The finer, store bought shredded cheese tends to clump up and get lost. Cube the cheese so it creates pops of yellow and a distinct flavor pop as well. MUCH better. Cook the bacon to done but watch it! It’s very easy to go from done to burnt bacon. You want the bacon grease mostly cooked out so the salad is not greasy. But keep it brown not charred for best results. Chop the broccoli into a variety of sizes. But keep them all small enough to easily sit a fork. The dressing will not penetrate very dense pieces of broccoli crown. This is a beautiful, easy broccoli salad and it makes a lovely side dish. AND you can tweak this recipe to up the healthy factor. For a REALLY heart healthy salad dressing recipe use our Homemade Healthy Mayonnaise recipe for your broccoli salad dressing base. It’s delicious. and uses avocado oil which is a VERY healthy fat. Make a batch of our mayo in just a few minutes in your food processor. This recipe is already gluten free. so it’s even a BETTER option for a large crowd where you may run into special diets. That is certainly true in our family. Want it lower carb? Use an artificial sweetener and add more protein with extra cheese, nuts or pumpkin seeds. I call for sugar in this recipe. But you can replace it. In the video I use pure maple syrup. Maple syrup is not as bright a flavor as granulated sugar. It’s more caramel in nature but the dressing still went over well with my family. Honey or a Stevia type sweetener should work. Let me know how you make this recipe your own. Organic Apple Cider Vinegar (look for a label that says it includes the mother) adds good things for your health. Broccoli is so delicious, versatile and healthy for you. Click the link to find out more about this wonderful vegetable and how it benefits your health. Choose an Organic head of broccoli to avoid unhealthy pesticides. I highly recommend you look for a source of unprocessed bacon near you. We use the butcherBox subscription service for our uncured humanely raised meats. You may find locally available uncured Bacon in your grocery. Using uncured Bacon gives your family fewer chemicals in their diet. I think it’s worth it. Bacon adds such a huge boost of flavor and crunch to recipes like this. Put it in there. I have done without it but the salad character suffers. This healthy, nutritious side dish appeals to a large audience. It’s ever popular in all age groups. Bacon broccoli salad recipe doubles well for a large crowd, travels well and you can make it ahead. This beautiful, delicious and healthy potluck recipe will make you a foodie star in your family. Bacon Cheddar Broccoli Salad is gluten free and low carb. A healthy, nutritious side dish the whole family will love. Party food, grill side or a healthy salad for lunch! A very easy, tasty salad full of healthy ingredients. The whole family will love it. A very popular potluck or party food! Whisk together the dressing ingredients and adjust them to your personal taste.Set aside. Set a skillet to medium heat. Lay the bacon strips in and cook covered until browned. Turn the bacon over and cook covered a few more minutes until browned but NOT burned. 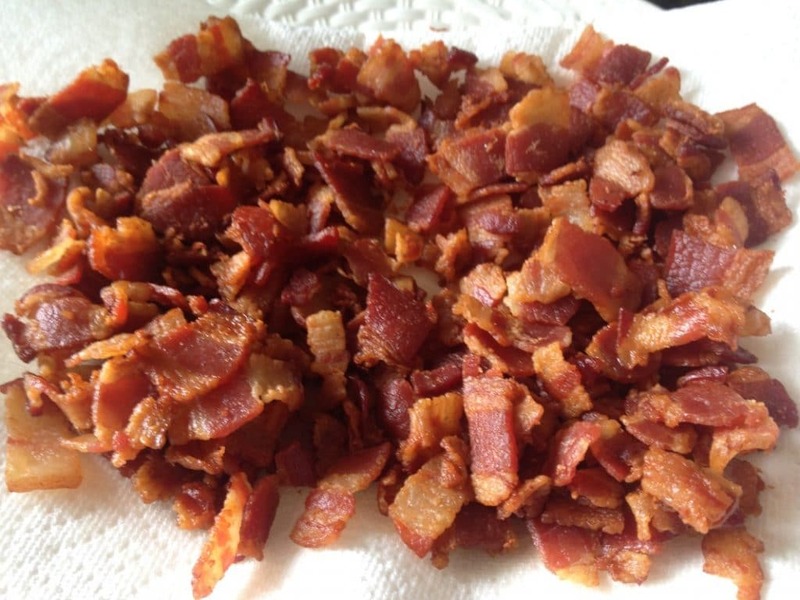 Remove bacon to a cutting board and chop when cool to touch into 1/4 inch pieces. Set aside. Meanwhile chop and measure broccoli, onion and cheese and pour into a large bowl. Add the chopped bacon and remaining ingredients. Pour the dressing over the assembled salad ingredients and stir gently until all parts of the salad are evenly coated. Serve at room temperature of chilled. This salad can be made a day ahead and refrigerated. It holds up to a week in the fridge covered as leftovers. Adjust the serving size according to your needs by doubling or halving this recipe. The dressing can be adjusted to your taste. Use mayo with avocado oil and unprocessed bacon for best nutrition. For a lower Carb option use sugar free sweetener. Please Note: This recipe is recently re-posted with new content and Pictures. We love this salad and know you will too. Let us know how this recipe works for you! Broccoli salad is a favorite in our home but your version with the cranberries is new and a must try. Hi Karen, If you have never tried this version of broccoli salad you’re in for a treat. The dried cranberries are a perfect counterpoint to the tangy dressing. Let us know how it goes for you please. Have a great day! Made this with turkey bacon and stevia. It is delicious! My onion was strong though and should have put less in. I love onion but not sure of the dinner I am taking it too! If not, I will just have more to take home for my family!! lol! Hi Jan, I’m delighted this salad worked so well for you. Lol, I’m not thinking you will have many leftovers. This one goes fast. Thank you for sharing that you used stevia and turkey bacon. So nice to hear how this salad works with different tweaks. Have a great day! Amazing! I brought this to a potluck and it was one of the first sides to disappear. Super easy! super delicious! Hi Jerauld, Thanks so much for the great review. We share you opinion. This is a fantastic salad. Have a great day! Would this recipe be considered Keto? 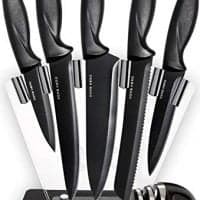 We do have a few KETO compliant recipes. Here are two Ranch Chicken Bacon BroccoliSkillet Dinner and KETO Peanut Butter Bars but no salads yet. With Amanda’s suggestions this salad could work for you. We’d Love to know how it goes for you. Thanks and have a great day! No need for sweetener of any kind if you add some chopped apples to the salad – yummy! Hi Rebecca, What a great tip! I’ll have to try apples in this salad. Sounds yummy. Thanks for sharing! Absolutely fantastic salad. I also added a small amount of peanuts…so what is a FEW more calories. Gives a bit more crunch. Hi Anne, Peanuts sound so yummy in this salad. Thank you so much for letting us know how much you enjoyed it and sharing your add ins. Nothing like a bit of extra crunch for sure! Have a great day! Is there a healthier meat that will go good with this? I wonder if smoked tuna or smoked salmon would be good? Smoked Salmon Might be a good bet in this salad. Let us know how it turns out! Happy St. Patrick’s Day! Also, why would I have to use vinegar “with the mother”? I’ve never heard that before. Would regular vinegar work? Or maybe Apple Cider Vinegar? 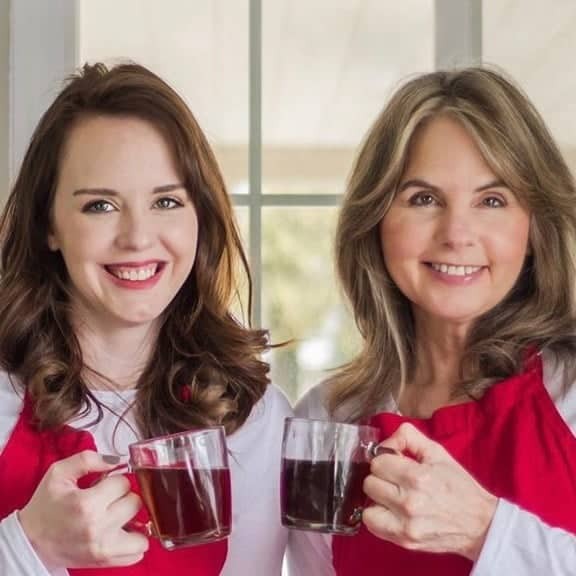 Hi Gayle, The ‘mother’ is a colony of beneficial bacteria that naturally form in organic raw unfiltered apple cider vinegar. The health benefits of this type of apple Cider vinegar are becoming more clear so that’s what I recommend. Any apple cider will work for this recipe. Serving size is about 1/ 1/2 Cups. Thanks so for your questions and Have a great day! Just made this and it is Delicious! I used Swerve for the sweetness…. worked perfectly! YUM! Thanks so much! Hi Vivian, Thank you so much for sharing your results with us. You made my day with this wonderful comment. So glad this recipe worked well for you. We love this salad. I really appreciate your passing on the Swerve tip Too. That makes this salad very low carb indeed. Have a truly excellent day! Do you have a carb count for each serving? Hi Glenna, I do have the nutrition per serving for you on this recipe. I will input it into the recipe. Thank you for asking! Hi Nancy, No I never have. I would not recommend it though. The fresh broccoli gives the salad crunch and flavor frozen will lack. Let me know if you try it that way. But if you do and don’t like the results please try the recipe again with a good quality fresh broccoli. I’m pretty sure you will like this salad better that way. Thanks for the question! We absolutely LOVE this salad April. It’s really good! This is happening for lunch for sure! 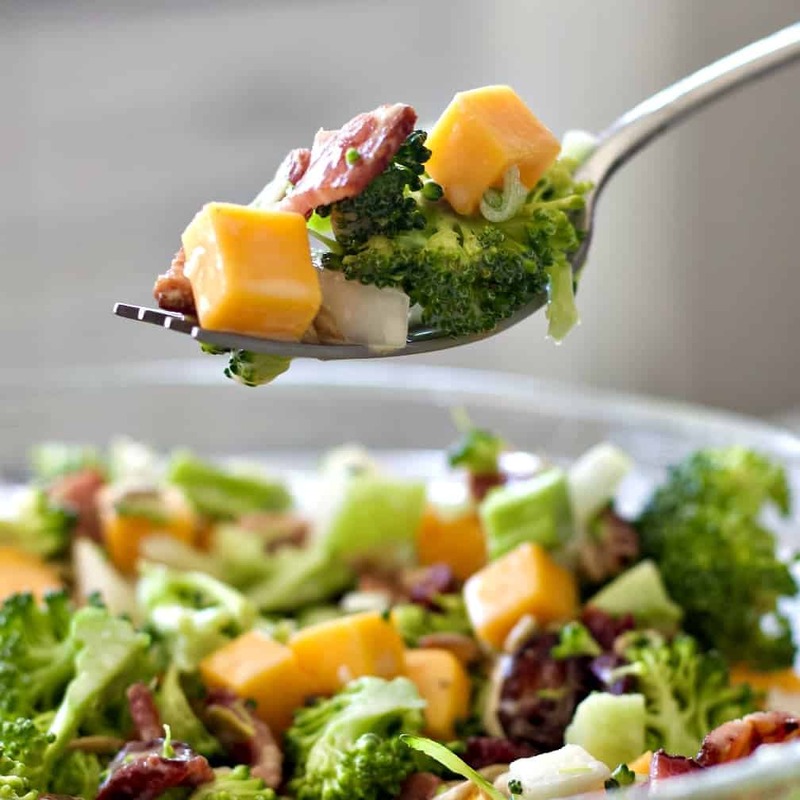 Jennifer, This bacon cheddar broccoli salad is a perfect choice for lunch! Thanks so much for stopping by! Love the sound of this salad. Broccoli and bacan together must be delicious! Broccoli and bacon are a marvelous combo in this salad. Thanks Del! Perfect a side dish but also as a whole meal by itself! Very summery! I hope you do make it. It’s so good. A real crowd pleaser! I love broccoli salads! And yours looks fabulous! I bet this is delicious! Thank you Deb!This is one awesome salad! Thank you Debi. It is as good as it looks! What a beautiful and colorful salad! This salad is not only gorgeous, it’s made up of all of my favorites! Super YUM!! This is a salad with lots of flavor and texture, love it. This is tasty inspiration for a delicious summer dish. I love that it revolves around healthful broccoli. YUM! Thank you KC! We love this salad! Bacon and broccoli just go so perfectly together in a salad.